what was i to do with a couple hundred dollars worth of beautiful paper leftover from silkscreen class at Parson's? i hoarded this paper for years, promising myself to use the back sides of them for something important. 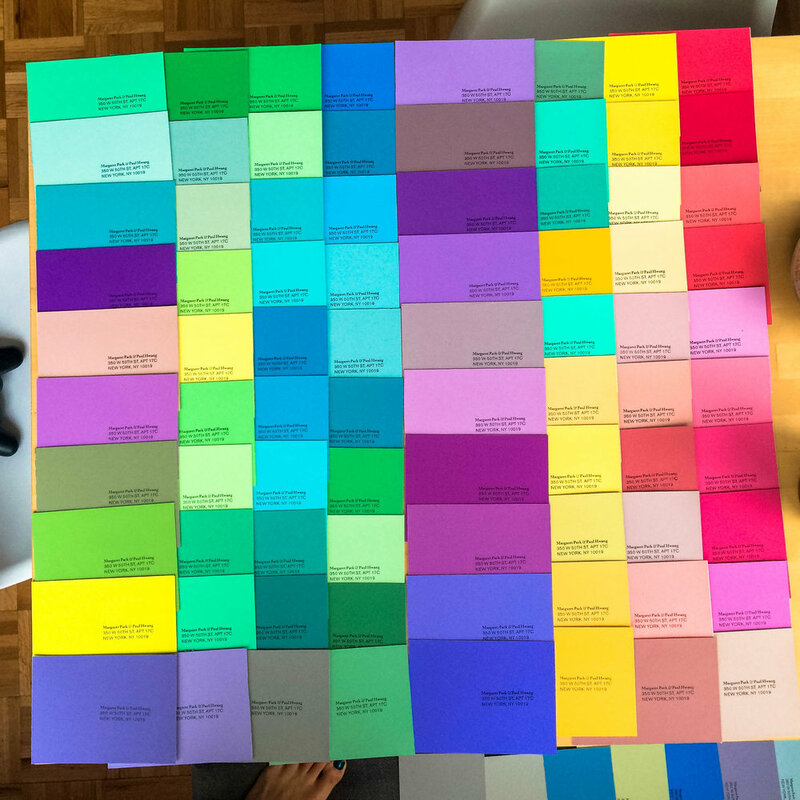 also leftover from design school: a barely-touched complete set of Color Aid swatches. with a lot of double-tac and more slicing & dicing with my xacto blade, a couple hundred RSVP postcards were created. a few process shots and loose directions below. start by carefully adhering the color aid chip sheets to poster-size double tac. the tac is a lot thinner than the color aid sheets, so a ruler wasn't needed during the next step: cutting them all up! separately, cut paper to match the width of the color aid sheets. layouts for the rsvps were printed 3-up on a laser printer. once all of the rsvp sides are printed, peel off the back side of the double tac and adhere to the back of the paper. a custom rubber stamp was super handy for the address side, also used for the return addresses on the invitation envelopes themselves.